Capital Exhibits is one of the largest wholesaler banner stands & display graphics company in the US. All wholesale trade show displays come with limited lifetime warranty! 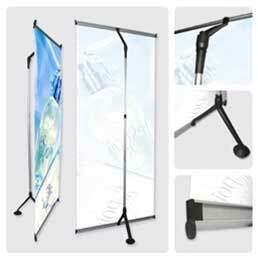 Bellow you’ll see an small selections of the types of cheap banner stands we offer including but not limited to retractable banner stands, wholesale trade show display stands, economy wide roll up banners especially suited for indoor events. We incorporate wholesale retractable banner displays with your 10×10, 10×20 and 20×20 cheap booth with high quality fabric printing. Ask about our stand banner design and quantity discount for your next show. Call us for any large project and get manufacturer direct pricing with printing and blind shipments to multiple locations anywhere in USA. Our portable displays are great for exhibitions, presentations and point-of-sale applications and offer a cost effective method of getting your message across. Take advantage of our wholesale displays for your next trade show or convention event from Capital Exhibits and save money with our FREE ground shipping on most items. Choose from a large selection of quality products to display your company message at trade shows, meetings, company events, at point of purchase and retail locations to draw attention to special promotions. Bannerstand make a great addition to your trade show booth too & high quality banners on the cheap stands is ideal with you are looking for volume like 1000s of stands and more which called displays to go. Attending a trade show can be a very effective method of promoting your company and its products. And one of the most effective ways to optimize your wholesale trade show displays and increase traffic to your booth is through the use of retractable bannerstands. Our affordable retractable banner displays for your show displays draws attention to your booth and helps you deliver your message to prospective clients, current customers and business contacts at what is usually a highly competitive event. Your show exhibit should stand out from the crowd, and a banner stand is a great way to make sure it does. There are many aspects of trade show banner stands that make your investment in one worthwhile. Banner displays can be designed with your company logo or graphics, and include the important information you want to convey to prospective clients. They can be used in conjunction with a trade show booths or on their own to advertise a product, announce an event, or showcase information about your business. They can be used as an extension of your trade show booth at a show because they can be set up in other areas like the show lobby or at the end of an aisle. 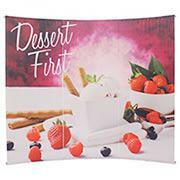 Additionally, trade show banners are lightweight, portable, and easy to set up and take down.